I was first drawn to this book by the gorgeous cover. I mean... look at it. It's GORGEOUS. I think this is one I'll need to add to my shelves so I can stare at it. But as we all know- we shouldn't judge a book by its cover, right? Not here. You can totally judge. What's inside this book is as beautiful as the outside. This is the ultimate summer read in my opinion. 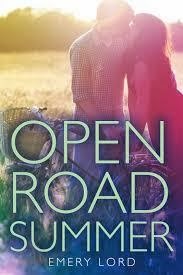 Road tripping with your bestie, cute boys, falling in love, heartache- it definitely makes for a summer read! Being a huge music lover myself, I loved that this took place on a musical tour and that we were able to see the impact music has on all of the characters. Pacing: I loved the way the book came together and I was engaged from start to finish. Being on tour was a lot of fun, as I liked seeing everything play out in the different cities, as well as how Reagan and Dee handled obstacles that were thrown at them. I felt the pacing of the romance was perfect- it wasn't rushed by any means, and I felt that was really important to the development of the story. I was afraid of a love triangle at first, with two young girls and one sweet, good looking boy. That is not the case however, so I was really happy Lord didn't go in that direction. Storyline: As I said, I love books about music, and I used to love reading fanfiction about a certain boyband and being on tour, so this was right up my alley. I like the idea of best friends going out on tour together for the summer. It must be extremely lonely being a teenager and being whisked to all of these places, doing what you love, but never setting down roots. Reagan and Lilah (Dee)'s friendship is such an integral part of this novel and I think Dee needed Reagan with her as much as Reagan needed to get away from the mess of her life at home. Dee is a growing country superstar and is still hurting over a breakup with her long term boyfriend. Her best friend Reagan joins her for her summer tour and together the girls are planning on spending quality time together and not letting their pasts haunt them. However, things don't go exactly as planned, and now Dee needs to handle some bad press to keep her good, sweet girl image untainted. The solution? Bring in a cute, boy next door type and let the press make their own assumptions about their relationship to get the heat off the bad stuff. Reagan is determined not to swoon and fall all over Matt Finch, but the more she gets to know him, the more she realizes her heart isn't as safe as she once thought. I love that this story has it all- a great solid friendship between two girls, a slow building romance full of teasing and fun, and watching them navigate the waters of fame, heartache, misunderstandings, and love. Characters: I'm going to start off by talking about Matt. I absolutely adored him. Sure, he did some things that pissed me off a bit, but overall he is a GOOD guy. He joins the tour to help with Dee's negative press and the goal is to let fans see them hanging out, spending time together and take the heat off the picture that's surfaced of Dee and her ex-boyfriend, Jimmy. Matt and Dee knew each other previously, so the two are already friends, which really helps make the situation less awkward. I loved his and Reagan's interactions. He isn't deterred by the fact she has steel walls around her heart and befriends her anyway. Matt understands pain and loss and that is part of what gets Reagan to open up to him. He really likes her, but he doesn't push her into a relationship with him. I really felt it happened naturally and had it happened too fast, it probably would have just been a casual hookup. Matt isn't perfect, though. He gets himself into a pickle at the end and while I didn't believe what my eyes (or Reagan) were telling me, I was still shaking my head because he didn't see it coming. Guys really are clueless. As for making Reagan feel the way he did while interacting with another individual, I don't think it was intentional, but it still hurt her nonetheless. For as tough as Reagan comes across, she is also very vulnerable underneath that hard exterior. She has been in trouble and making bad decisions for some time now, but it all came to a head and had to deal with some serious consequences. Reagan has not known stability in her life- her mom abandoned her and her father at a young age, her father drank too much, and now she has a stepmother who she really can't stand. Getting away from everything is the one thing Reagan desperately needs at this point. She needs to learn how to stand on her own and realize her own self-worth. Matt and Dee both play a large role in this, but ultimately it's Reagan who has to make her own choices. I was a little irritated with Reagan over what happened with the whole Matt thing towards the end. I thought she was being ridiculous and it was unfair of her to make that judgment call about him, when he'd never done anything to prove himself any different that the guy she knew. She has some self-confidence issues, which I get, but running away is not the answer. Reagan is incredibly loyal, however. Her friendship with Dee is such a special one and she really would do anything for her best friend. Dee is one of those kind, sweet people who sees the good in everyone and doesn't let the evil and wrongness of the world taint her personality. She has always believed in Reagan, but she doesn't push her either. She needs her best friend with her, as she is still hurting over her breakup with her boyfriend Jimmy. You were all ready to hate Jimmy's guts for hurting such a sweet girl, but really he was letting her go to pursue her dreams and didn't want to be the one at home holding her back. Dee is definitely the more emotional one of the two, and she is very empathetic to others. She balances out Reagan's wild side with her calm one and together the two just have one of those friendships that will endure anything. Final Thoughts: I really enjoyed this one. It made me long for the freedom of summer and made me miss my own best friend like crazy. The romance was incredibly well-done, and I loved the importance of Matt's lyrics and how significant they were. Emery did an excellent job of making the reader feel as if they were along for the ride and while it may not have always been smooth- it was worth the journey. I really want to read this one! It sounds so good and I really love that is seems like the friendship is just as important as the romantic aspect. Also very purdy cover. Great review! It's a cute one Teresa. And I really liked how dominant their friendship was and how that came first. I LOVE this cover! YES YES YES YES! I was first drawn to the pretty cover and then when I read the synopsis I was sold! So happy the book lived up to my hype for it, and yours! Yay! I'm SO glad I got this one! It was one of my big reads this year and I'm SO glad it lived up to the hype! I really liked this one too. I loved Reagan's character and Matt was swoony. I want to know what happens with Dee. Yes! I feel like we needed a bit more at the end! I like that it was realistic, but I want to know so much more! Open Road Summer sounds like a great read, Jessica. I'm glad you were able to judge this one by its cover. :) It seems as though Lord gave everything a perfect balance to create a really enjoyable story. Lovely review! Thanks Brandee! It was such a good read and sometimes these can be hit or miss. I'm glad it was a hit! Matt sounds like a character I wanna meet!! :D I also love books about music (and I don't read enough of them), so I think I need to check this one out! Loved your awesome review! Thanks Magen! Books with music completely make my life. Hahaha. I crave them! I keep hearing good things about this book, everyone seems to really like it. I do love a good friendship book and this sounds like a great summer read. I wish it came out in the summer because it would have been the perfect start of summer book!